First, thank you, veterans, for your courage and commitment to our nation on this and every day. ﻿There's some stuff happening here at BCB right now. Since my last post I started drinking the Blonde Ale I was so worried about. Apparently the odd bubbles I saw on the surface of the wort were perfectly normal. The beer tastes good and I have no worries about sanitation. The Bitter I made after that is pretty nice too. I made my first Nashville lager, an Oktoberfest a couple of weeks ago. I did a decoction as always with this beer. It's going to be in the fermenter for a while longer before I start racking and bottling. I'll harvest some of the yeast to make a Winter Bock in a month or two. I recently learned that while I was making an American pale last week an earlier version was earning a 3rd place in the American Ales category at the 2011 Music City Brew Off. As I've said before, I'm thrilled to place with a Pale. Since this category usually gets more entries than most, even getting an honorable mention means you're probably making pretty good beer. What I'm really interested in, though, are the score sheets. That's where you really find out how your beer was perceived by people who know and appreciate beer. 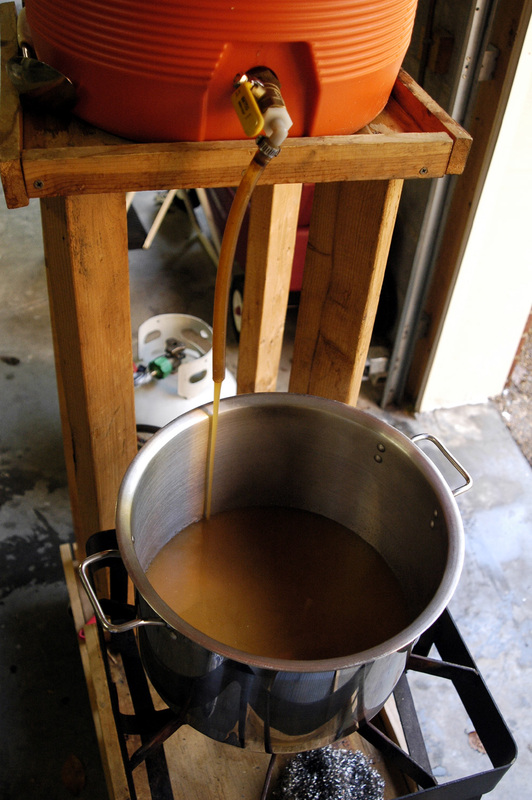 Anyway, I racked the Pale into my plastic fermenter yesterday (because there was no other place to put it) so I could harvest California Ale yeast to make a Veteran's Day IPA. I hit just about every measurement during the process and have strong expectations that this will be a competition beer. The color might be a bit light for some but I think it'll be within the style guidelines. I put everything in my new beer room for the moment. The room will look much nicer when I get shelves built and gently used carpet squares installed. I'll bottle the Pale next week, rack the IPA into the bucket and harvest the yeast again so I can make my wife an American Brown next Friday. Tonight after work I think I'll enjoy some of my labor's fruit.